This report includes detail of events occurring on 14 January when Laiza was hit by Burma Army artillery fire, as well as Burma Army activity in other areas of Kachin State in January. Jangmaw Bawk San, a two-year-old girl, sustained superficial head wounds from the attack. Lang Jaw Nu Kai, an eight-year-old girl, was hospitalized for serious wounds to her hip and leg. 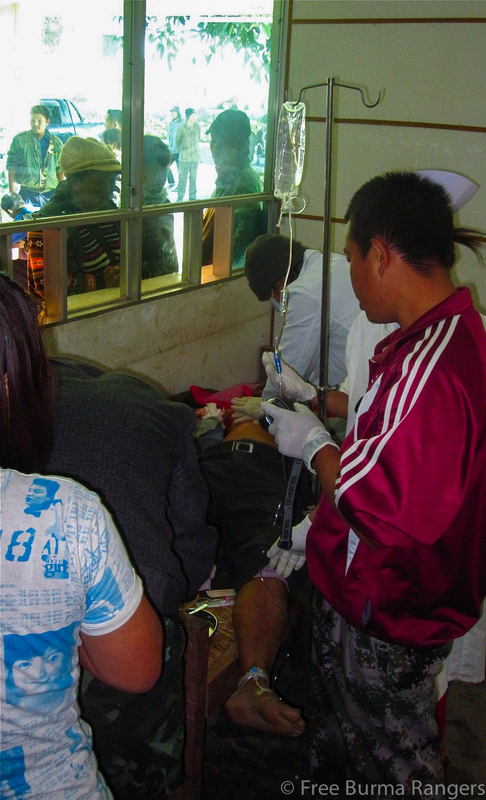 Lagwi Sau Nam, 38-year-old mother of Hpauyu Doi San Awng, injured on left leg. Nangzing Roi Ji, a 56-year-old woman, abdominal, buttock and leg injuries. The first round landed in front of a family’s home (Location: N 24.755058 E 97.555356). This blast was responsible for the deaths of Nhkum Naw Bawk and Malang Yaw. It also injured others – including Lagwi Sau Nam, the mother of the 15-year-old boy killed by the first artillery round. The second round landed in front of a house 60 meters away from the first, killing the 15-year-old boy (Location: N 24.755197 E 97.555981). The round impacted on a berm only 2 meters from a busy street, deflecting most of the blast towards the house, and away from the many people walking on the sidewalks nearby. 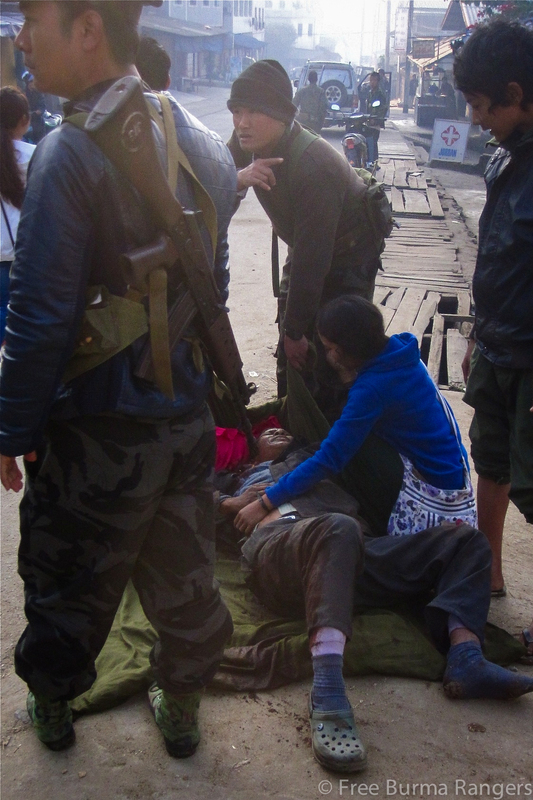 The wounded man pictured here, Malang Yaw, died less than an hour after the photo was taken. Malang Yaw in his last moments at the hospital. 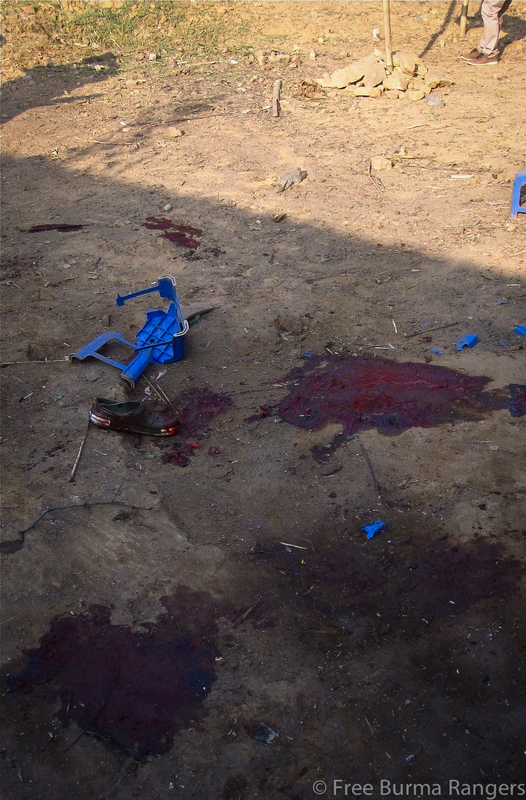 Front yard of the home hit by the first artillery round, with Malang Yaw’s left shoe in the foreground. 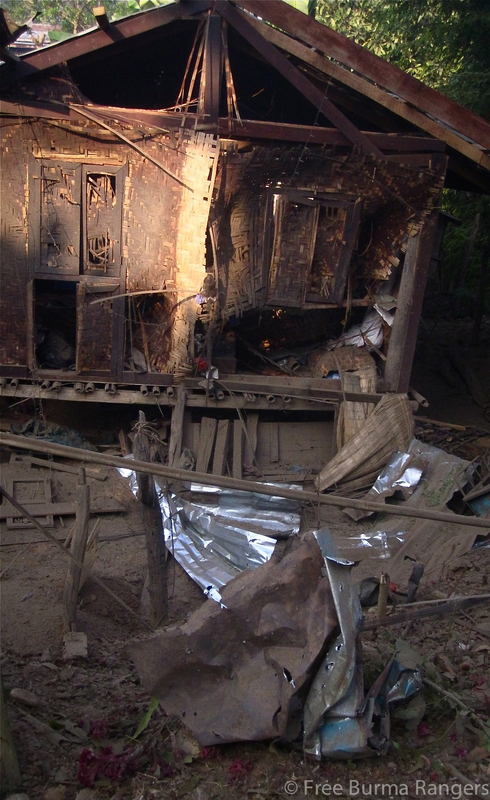 15-year-old Hpauyu Doi San Awng’s home that was destroyed by the second artillery round. At 10:30 PM the same day, two more 105 mm artillery rounds landed near the same neighborhood hit that morning. Between the morning and evening attacks, Burmese presidential spokesman Ye Htut told AFP that the Burma Army does not intentionally target civilians. One artillery round landed on a hillside road west of the city center (Location: N 24.753545 E 97.552547). The second round landed on the hillside behind a hotel in the same area (Location: N 24.753353 E 97.554771). Since most people had evacuated the area, no one was injured as a result of this second attack. In the early afternoon on 15 January, two more rounds of 105 mm artillery impacted near Laiza. One exploded 71 meters northwest of a petrol station northeast of the town center. After the artillery fire on 14 January, merchants stopped coming to the streets, and many civilians began moving their families and belongings further north of the city. Fighting continued in areas in and around Laiza. Fighting also continued at Hkaya Bum. At 2:15 PM on 15 January airstrikes began, with at least two K8 ground attack jets spotted in the area, and on 26 January, Burma Army took control of Hkaya Bum. Attacks near Mai Ja Yang by Burma Army troops from Division 88 and IB 56 began on Sunday, 13 January 2013. There were two air attacks: the first lasting from 12:10 PM until 12:40 PM, and the second from 3:45 PM until 4:15 PM. In each attack, two jets dropped bombs and fired machine guns. 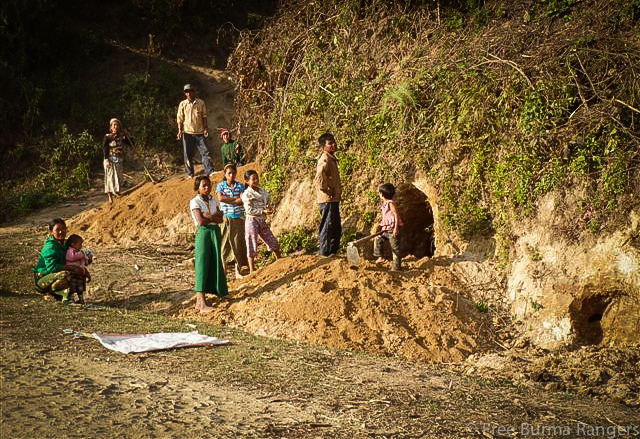 Internally Displaced Persons (IDPs) in many camps in the Mai Ja Yang area began digging bunkers and caverns in hillsides to protect themselves from the air attacks. At approximately 2:00 PM on 15 January 2013, three boys just outside Pa Ka Htawng IDP Camp were playing in a bunker when it collapsed on top of them. 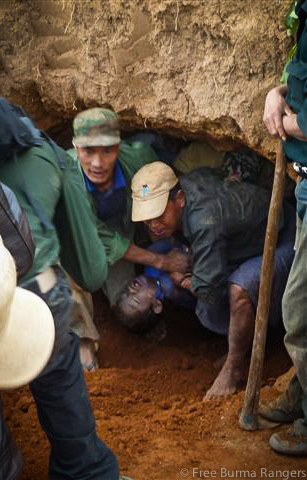 Men from the IDP camp immediately began digging in an effort to rescue the boys. Two of the boys were already dead when the men reached them. Medics on the scene tried to save the third boy, but he died within minutes of being pulled out of the bunker. The Burma Army was directing most of their attacks on KIA positions at Jan Mai Bum and La Gat Bum, using 120 mm mortars and RPGs. On 11 January 2013, fighting broke out between the KIA and the Burma Army at Kawapang in 1st Brigade, and in areas throughout 3rd Brigade, KIA soldiers were fired upon with 120 mm mortars and 105 mm artillery from Burma Army soldiers of Military Operation Command (MOC) 21. On 12 January, the Burma Army continued to fire upon La Jai Yang, Nam San Yang, Lai Lum Awng Ja, Hka La Kadawng and Pang Wa. The Burma Army used 81 mm and 120 mm mortars, and 105 mm artillery in their attacks. The Burma Army units responsible for these attacks were Infantry Battalions 13, 388 and 390, as well as Light Infantry Battalions 10, 77, 258 and 259. On 13 December 2012, in Bang Gaw Thing Nu Village, two men were arrested by Burma Army Strategy Commander Tu Ra La Muit, of Division 99. The two men are Tsum Hka Gam Hpang, the 46-year-old village headman, and Tsum Hka Na Ja, 45 years old. They were on their way to farm at the time of their arrest, and there are no updates concerning what happened to them.